Freechoice: Explore Bucharest and learn about its communist past, including a visit to Ceausescu’s Spring Palace. Or tour the Village Open Air Museum and discover ethnography exhibits depicting Romanian heritage and culture. Relax and admire the scenery as you cruise the spectacular Iron Gates, a narrow gorge that the Danube has carved out between the Carpathian and Balkan Mountains. It’s a spectacular setting for a cruise and also the natural border between Serbia and Romania. Freechoice: Explore Osijek on a guided city tour, or if you’re the more active type, you can opt to take a blissful guided bike ride through Osijek’s countryside. 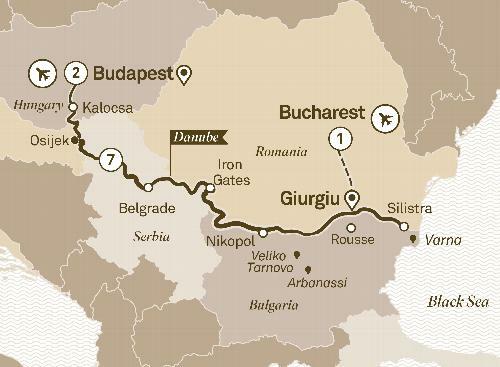 Journey through unspoilt lands, lush landscape and centuries of fascinating history as you discover Eastern Europe. Cruise on board your luxurious Scenic Space-Ship from the picturesque Black Sea all the way down the Danube. Begin your adventure in Bucharest, then journey through a handful of unspoilt lands, where lush landscapes are punctuated periodically by towns and cities that still look as they might have over a hundred years ago. End your journey in Budapest, regarded by many as the most beautiful city in Europe.